Asked the hacker to Suzy the website owner, and Erin the consumer, and regular Joe who’s just trying to make a life for himself and doesn’t want someone else stealing it. Suzy, Erin and Joe have something in common. They’ve made all their passwords very difficult to hack. Now I acknowledge that if you are like me (and most people aren’t, in this way) you may have over 100 passwords. Keeping up with them can be a pain in the tuckus and time-consuming. So maybe your Foursquare account doesn’t need to be fussed with so much. But with any account where you do commerce (purchase anything), you ought to be locking that sucker down. Even if you don’t tick the box that allows the site to save your info. I have just started to set up an account with LastPass.com. This is a cloud-based “vault” for all your passwords. This way you can do the right thing and make all your passwords truly difficult to decode, and you only have to know one password: the one to your LastPass account. Wait what?! You’re thinking, “what if LastPass gets hacked; all my passwords are there for the taking!” Not necessarily so if you use what is called 2-step authentication. This means you not only set up a password for your account, but there is a second step to gain access to your account. This second step can be a variety of things such as being required to login in from a specific computer, or having a thumbprint connected to your account. Anyway, I’ll write more about LastPass after I’ve gotten to know it better. But even if you don’t use a password manager, you should use 2-step authentication whenever it’s offered. 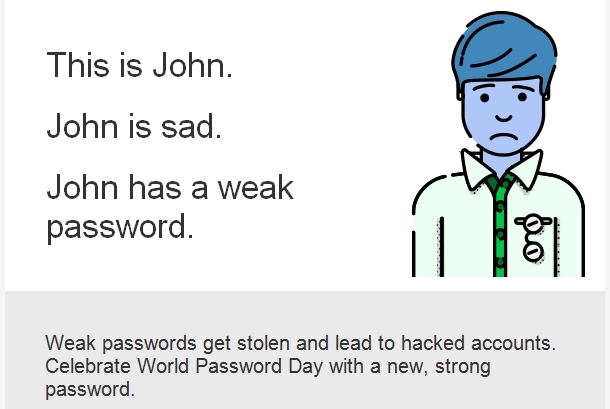 Remember guys and gals, it’s a lot cheaper and easier to make your passwords difficult than to undo being hacked, having your credit card number stolen, or worse yet, having your identification stolen.